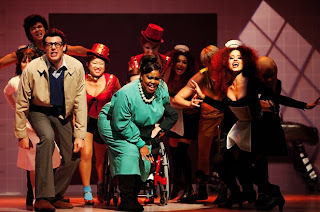 ...Set: Glee 2x05 "The Rocky Horror Glee Show"
I'm sure a lot of Rocky Horror fans probably loved the homage in this episode, but to be perfectly honest, I was not feeling it. Perhaps that's because I've never seen Rocky Horror myself (the horror! ), but it also could be because there was so very, very little story actually going on. It was all about the performances, yet again. I'm sick of the overload of songs! Now that I've got that off of my chest. What was this week's show even about? Pretty much it was all just to teach Will a lesson about how he was using the glee club as a way to get close to Emma in a rather creepy way. He was being narrow-sighted about whatever and whatnot, which is his usual storyline. He gets called on it, and supposedly learns a lesson. Since Carl has started to help make Emma less OCD, he decides that if he loves her, he will let her go. For now. He made sure to add in a for now in there. Otherwise, there were really only a couple of tiny side stories. Finn was worried about having to strip down to just his underwear, which, by the way, he called tightie whities, but they were in fact just plain white boxer shorts. That is not what a tightie whitie is, okay? Anyway. He spent the episode worrying about it, while Sam spent the episode reveling in his awesome body. Which, it turns out, is rather awesome. Hello abs! I'm kind of loving Sam, by the way. He's unexpectedly cheesily hilarious without knowing it. Finn ends up going down the school hallway in his underwear to try to prove a point of some kind, and almost gets suspended for a month. The other main side story was that Sue was secretly going to undermine the show while pretending to be a proponent of it. She was approached by some cable dudes to run an expose on it. It doesn't happen, in the end, because Will decides not to put on the show. Wah wah. And I mean literally, that's like all the story there was. Snooze. The Songs... which I'm not linking this time. The links are taken down half the time. I'm sure if you're a fan you've downloaded them. You know, I was actually bored for most of this episode (probably because I also haven't ever seen Rocky Horror). And the parts when I wasn't bored, I was just irritated by how creepy and unlikable Will is becoming! Also, was it just me, or was it very strange how the entire Glee club knew all about the RHS when Will proposed it? Is that really what kids in high school spend their time watching?? They are really laying it on thick with Will this season. Ugh. That is sort of strange. I don't think I would've known what it was in high school!